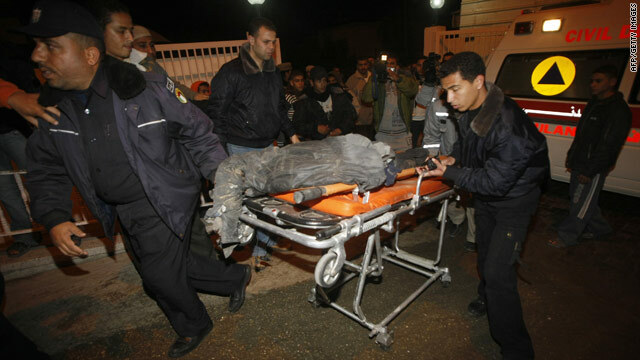 Palestinians wheel a body to a hospital morgue after Israeli airstrikes hit smuggling tunnels in the Gaza Strip, January 8, 2010. Gaza City (CNN) -- The death toll rose to three Friday from Israeli airstrikes along the Gaza Strip, officials said. Israeli Defense Forces said it launched four airstrikes along the Gaza Strip on Thursday, targeting a weapons shop and two smuggling tunnels. The strikes also hit a third tunnel, described as a "terror tunnel" with access to Israel, an IDF spokeswoman told CNN. Three Palestinians were killed and several others were injured in the airstrikes, Hamas security sources said Friday. Initially, the Hamas sources said one person was killed and four were injured. The sources said a secret metal shop used to make Qassam rockets was hit in Gaza City. IDF confirmed the strike. The airstrikes were in response to a series of rockets and mortar shells fired into Israel earlier Thursday, the IDF spokeswoman said. Four mortars struck the Kerem Shalom humanitarian-aid crossing on the tip of southern Gaza, forcing authorities to shut it down and prevent 70 trucks carrying fuel and other aid from entering the strip, she added. Qassam rockets are homemade projectiles that have been fired into communities in southern Israel for years. Though they are crudely made, militants have made efforts to improve the weapons' technology. Israel routinely targets the Rafah tunnels under the Gaza-Egypt border, which it says Hamas uses to smuggle weapons into Palestinian territory. Palestinians say the tunnels are needed to get basic food supplies that are not available in Gaza.